The modern world never tires of discussing the best ways to brew coffee–and coming up with cute coffeemakers to do it with. Designers Adrián Pérez and Mauricio Carvajal have made the process much more efficient by putting the grounds to good use, too (h/t Inhabitat). 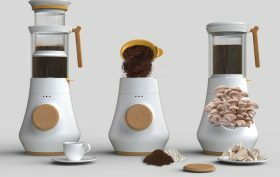 The duo’s HIFA coffee system repurposes coffee grounds to grow oyster mushrooms.